I finally feel like life is getting back to normal after all the Christmas festivities! Charlotte started school again today so we are back to having a schedule. Well. At least someone in the family has a schedule. Certainly 2-month-old Valentine doesn’t. She’s like a tiny 9-pound princess who forces me to bend to her every beck and call, or whimper and cry as the case may be. She’s started smiling at me regularly though, which is basically payment in full for my slave labor. Kind of like how I always make Eric hover nearby while I give the baby a bath. The way our bathroom is situated it’s pretty much a one man job, but I make him come in just to be present in case she freaks out. There is something about screaming wet babies that makes you panic a little bit. Speaking of panicking. 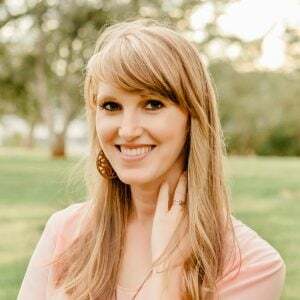 I had a friend of mine (hi Melissa!) watch the kids today while I went to the dentist. That sounds like such a casual statement, but I was freaking out . No, not because I was away from my kids, but worrying about poor Melissa. It’s hard enough dumping 2 kids on someone else, but 2 kids plus an infant?? I think I owe somebody a batch of these cookies. 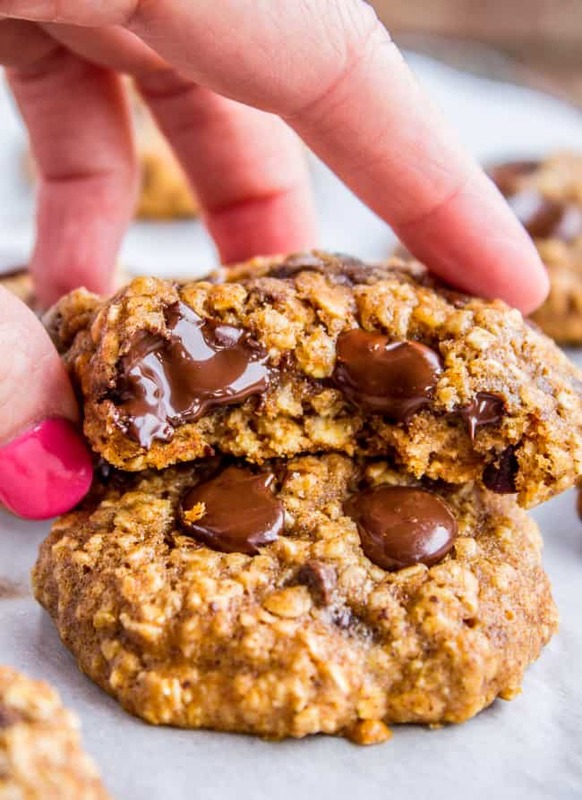 The recipe is a mashup between these Skinny Oatmeal Chocolate Chip Cookies and these Texas Cowboy Cookies. Both of these recipes made it in the Top 5 Recipes published on The Food Charlatan in 2016. I loved them both so much (and so did you!) I decided to put them together. I think it’s officially my best idea of 2017 so far. These cookies have the same flavor as the classic Texas Cowboy Cookie but have a different texture. I like it. I’m usually more of a soft-cookie girl anyway, and the original recipe is crunchy on the outside. 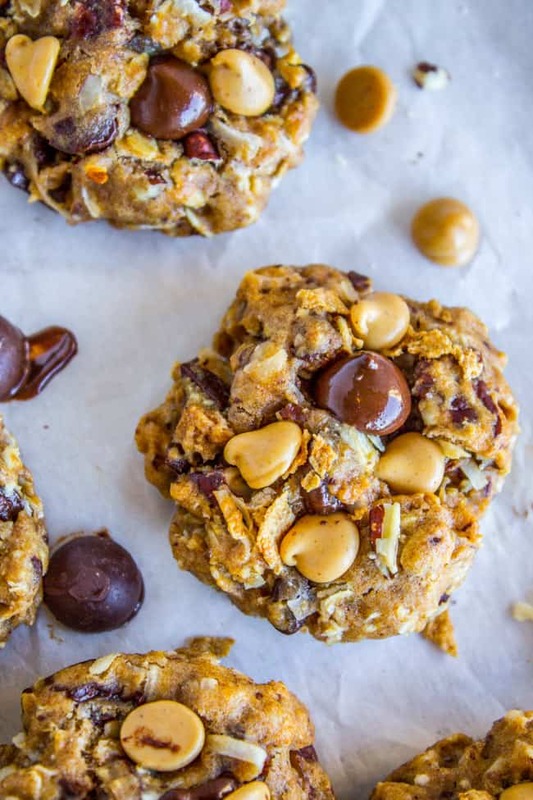 This skinny version is soft and tender, and feels decadent from the chocolate and peanut butter chips, but is way lower in calories. 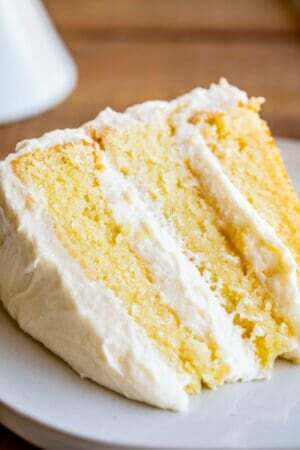 Plus it’s super easy; no electric mixing or creaming involved. Just a couple bowls and a spoon. 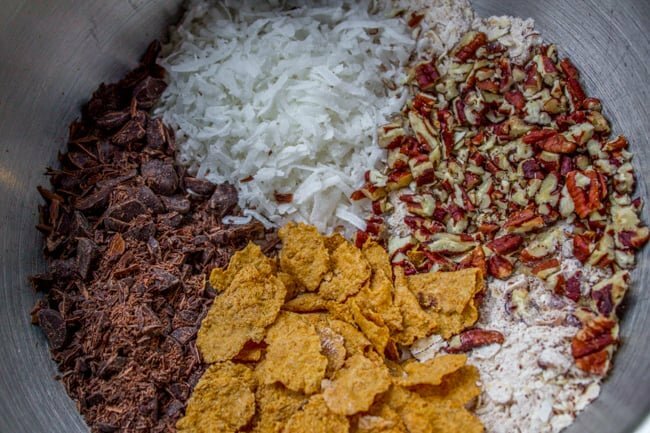 In case you’ve never tried the classic Texas Cowboy Cookies, it’s a basic dough with oatmeal, coconut, pecans, corn flakes, peanut butter chips, and chocolate chips mixed in. It’s an amazing combo that is so unexpected. For the skinny version (as far as mix-ins go), all I changed was to use bran flakes instead of corn flakes. The recipe makes about 18 or 20 small cookies, your only job is to not eat all of them in one sitting. Best of luck. *If you love honey flavor then by all means use it. The agave is a little more neutral. Either one works great! 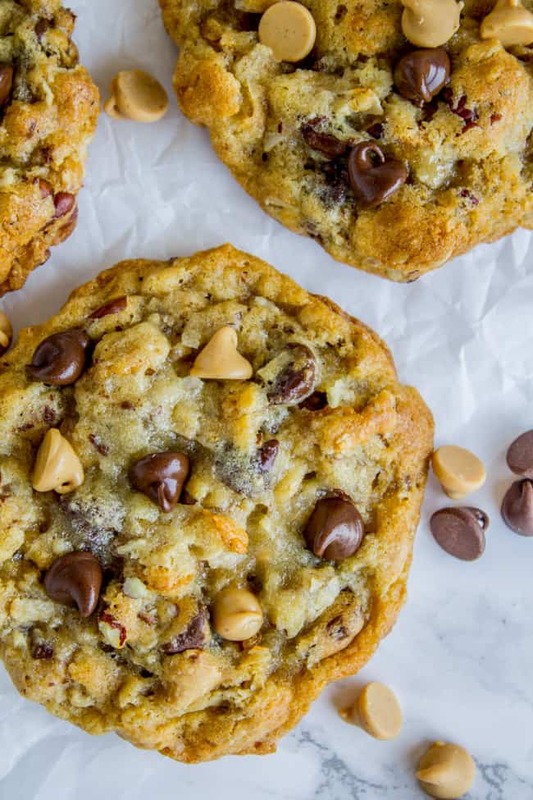 Here are some other cookie recipes you will love! 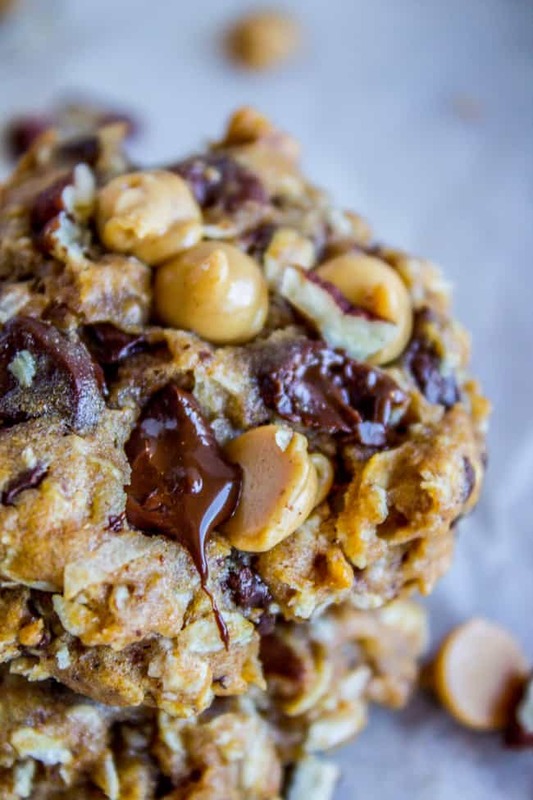 Skinny Oatmeal Chocolate Chip Cookies: << this is the one that I based today’s recipe on. They are on fire right now! I guess people are definitely wanting healthier treats this January! 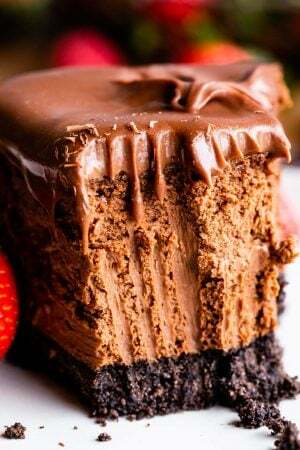 This recipe is from my friend Amy’s book Healthier Chocolate Treats. 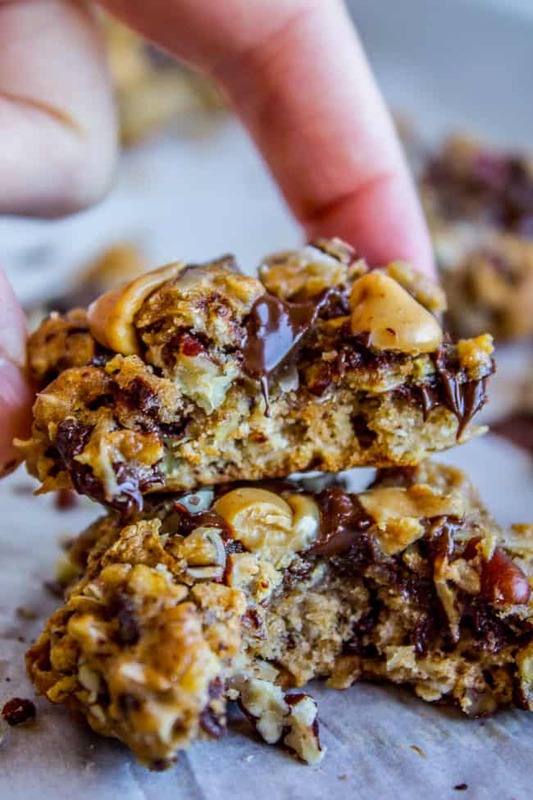 Texas Cowboy Cookies << Here’s the other recipe today’s cookies are based on! It’s so fun to play around with all the mix ins! 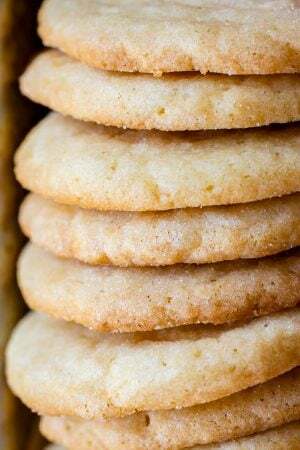 Brown Butter Sea Salt Butterscotch Cookies: << These. Are. Amazing. 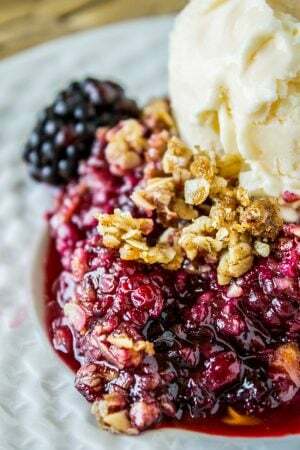 Ooh good idea with the flaxseed! I’m so glad you liked the cookies Anna! Thanks so much for your helpful comment! Good grief. Give her a break. 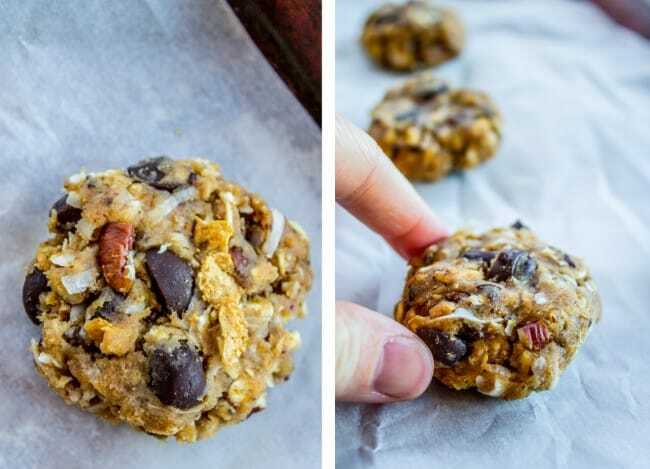 They are healthier than a “regular” cowboy cookie. 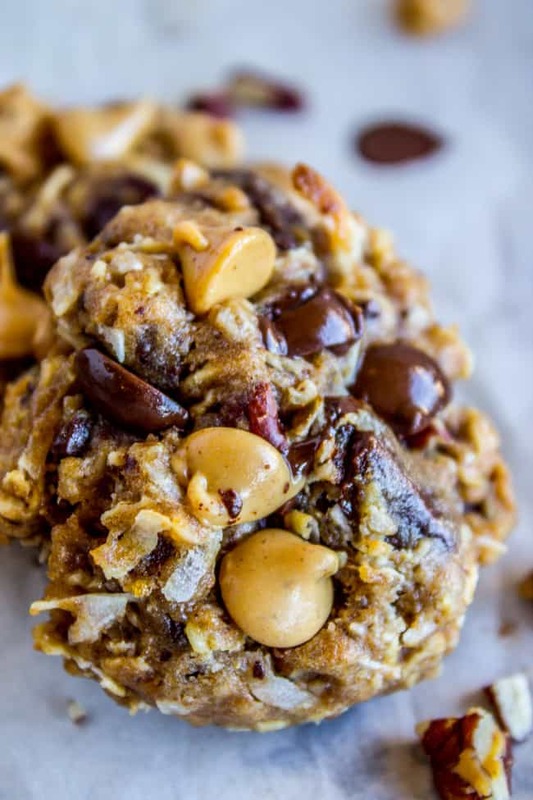 If folks are so worried about the skinny aspect maybe they should be eating an apple instead of trying so desperately to make a “healthy” cookie. Hahaha! This made me laugh pretty hard Jessica! Maybe if we replace the butter or sugar with apples it will be healthy? or something? lol! Karen, these cookies are wonderful! My kids love them and I’m happy that they’re not getting the ADDED sugar that other recipes come with. OK People bashing over them being called Skinny – You can eyeball the ingredients and determine that these have sugars, not refined white. For you low carbers, wheat flour is still flour substitute Coconut flour. Instead of honey use Stevia instead of regular use sugar free chips. Instead of bashing simply move on and make your own and post it. Then YOU can deal with all of the negativity people WILL post. I don’t care if they are they best food they’ve ever eaten. peace! Reese’s Peanut butter chips have 6g of sugar per tablespoon (so 24g in 1/4 cup). 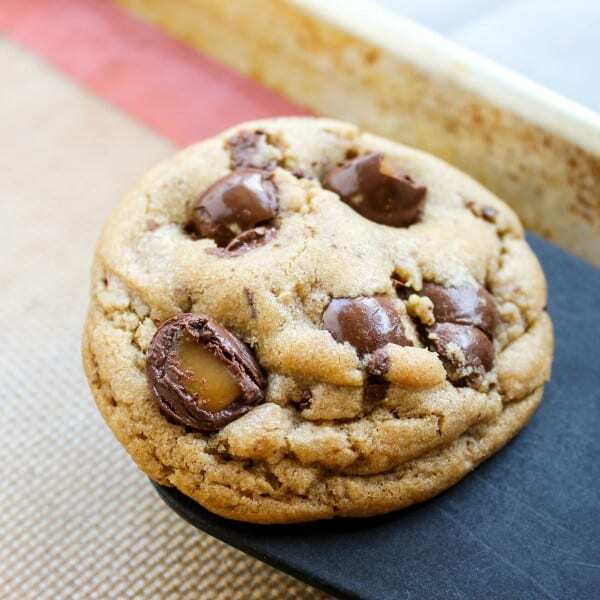 Chocolate chips have as much if not more depending on the brand (unless you use sugar-free), and honey or agave are both sugar, even if not refined white sugar. To say this recipe contains NO sugar is not accurate. I’m going to have to agree with Jason and call BS on your description. You really have to be careful with describing something as ‘SKINNY’ and ‘NO SUGAR’ in your description. 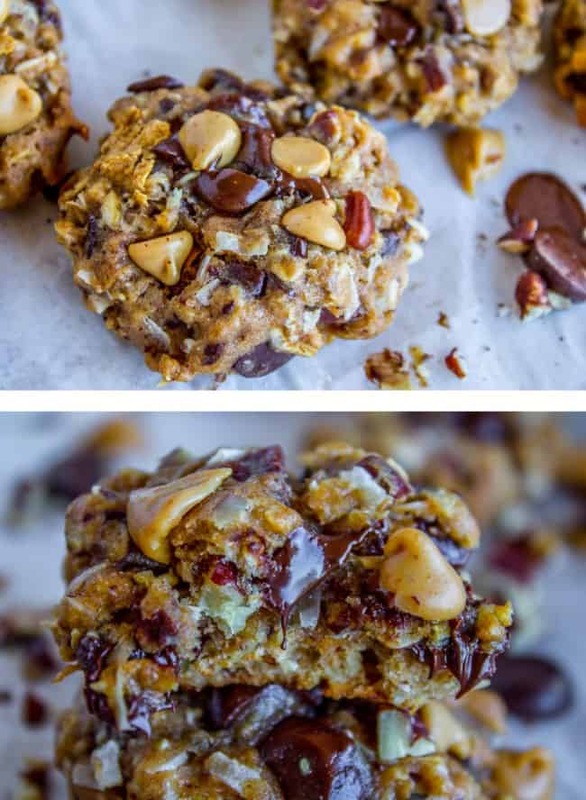 This gets shared around on keto boards (which is where I came from), and diabetic boards – and these cookies are nowhere near something we could eat. Not everyone is smart enough to find the nutritional value themselves, and most people blindly follow what you post – so please try and remember that in the future. Thanks for the info Christina! I can’t be responsible for what other people eat, or where they choose to post my recipe. And I disagree–I think pretty much everyone is smart enough to know what’s healthy for them to eat (which is different for everyone!) I take no responsibility for other people’s diets :) For me, a non keto non diabetic, these cookies are healthier than what I normally make, hence my description. Thanks again for looking up the calorie info! I’m sure that will help a lot of people! Hey Rae! I’m not sure. You could look up an calculator online though! 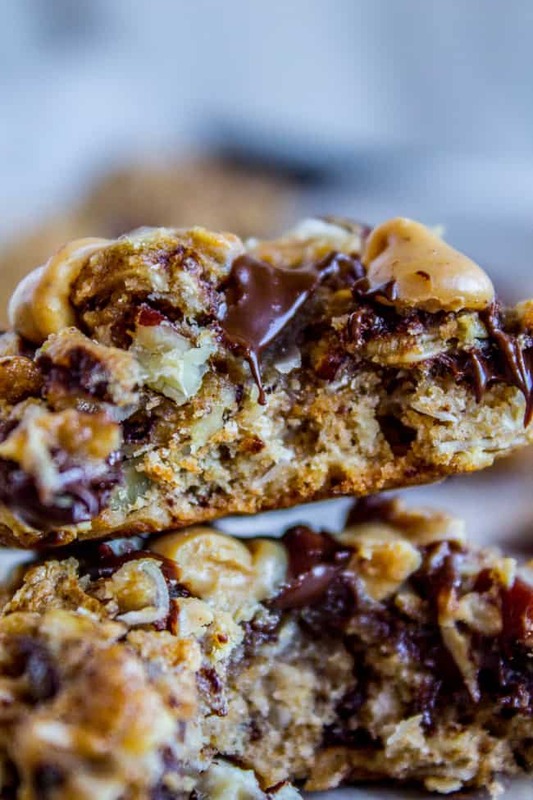 It’s hard to post a comment when all I can think about is dashing to the kitchen to make these cookies! right?? Why am I not making these again right now?? :) Thanks Annie!